PARIS — Renault and Nissan appear to be heading for a showdown over who will be Nissan Motor Co.'s next chairman, replacing Carlos Ghosn, who remains in Japanese custody accused of financial improprieties. Immediately after Ghosn's Nov. 19 arrest, Nissan CEO Hiroto Saikawa said Ghosn would be removed as chairman. Ghosn and Greg Kelly, an American Nissan board member accused of aiding Ghosn, are expected to be removed as directors at an extraordinary shareholders meeting April 8. Renault, as the controlling partner in the alliance with Nissan and Mitsubishi, says it has the right to name the next Nissan chairman under the alliance's master agreement. That decision has the support of the French government, which is Renault's largest shareholder. New Renault Chairman Jean-Dominique Senard would be a likely candidate, but Nissan is resisting such a move, citing concerns that a dual chairman would hold too much power — a charge that Saikawa leveled against Ghosn in a rancorous news conference after Ghosn's arrest. 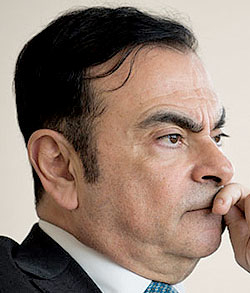 Before handing over Nissan's CEO job to Saikawa in 2017, Ghosn was CEO and chairman at Nissan and Renault for almost a decade. Senard will be named a Nissan director at the April meeting. The friction could stymie the expressed wishes of the Japanese and French governments — as well as Saikawa and Senard — to not only continue the alliance but to strengthen it. Under the Alliance 2022 strategic plan devised under Ghosn, the companies would increase cost savings from shared operations and economies of scale to $11.3 billion annually. In 2017 those synergies, which the alliance tallies itself, were nearly $6.5 billion. Nissan, Renault and Mitsubishi combined sold 10.76 million passenger vehicles last year, by some measures making the alliance the world's largest automaker. Letters between Renault and Nissan, revealed last week by the Financial Times, point to a deep mistrust between the partners. Lawyers for Renault accused Nissan of acting on behalf of Japanese prosecutors to get information from Renault employees. They said Nissan's actions were "inconsistent with the spirit" of the alliance agreement, and they expressed "concerns about Nissan's commitment" to the agreement. Renault acquired a controlling stake in a troubled Nissan in 1999, and now holds 43 percent of the Japanese automaker, while Nissan holds 15 percent of Renault shares. However, the French government is the majority stakeholder in Renault, with just over 15 percent, and enjoys double voting rights at shareholders meetings. Nissan — and the Japanese government — has long expressed concern about the French state's potential influence over a domestic company. "Nissan's position is negative" about having Senard, a former CEO of Michelin, as chairman of both companies, a person familiar with the matter said. "Having one single chairman may result in governance issues, especially when there are conflicts of interest." In the wake of the Ghosn affair — in which the alleged improprieties occurred over nearly a decade — Nissan has pledged to review its governance, including a possible overhaul of the board's composition. Renault plans a similar study under Senard. Another investigation is underway into the Dutch holding company, Renault-Nissan BV, that oversees combined operations. Renault and Nissan have reportedly hired Mazars, the French auditing company, to scour the company for possible financial misconduct. The Japanese business daily Nikkei on Friday, Feb. 8, reported a possible compromise that would allow Senard to be named chairman, in return for Renault reducing its stake in Nissan, and possibly the French government cutting its holding in Renault. The French Finance Ministry denied that it was considering such a move.